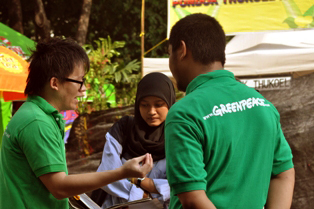 My name is Richi, and I work for Greenpeace in Indonesia doing action logistics and volunteer coordination. Recently, I coordinated the work that we did with community firefighting efforts in Riau Province, Sumatra, Indonesia from 31 July – 6 August 2009. Now, I’m back in the village of Kuala Cinaku, with my feet firmly planted in it’s yellow soil after over two-years. Not much has changed in this small village, but this time I’m fighting to breathe through the thick pungent smoke from the forest fires that annually blight the province of Riau on Sumatra’s east coast, opposite Singapore. I am here to check firefighting equipment and prepare teams for the peatland forest fires that are once again burning out of control here. China, the country that just held the most spectacular Olympic Games in History, and country with large new economy power. With almost two billion people, China is the most important market for Indonesia. 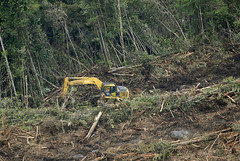 Couple years ago we heard that China was a large receiver of woods that came from illegal logging activities in Papua Forests. All 32 activists at a palm oil diesel refinery in Porvoo, Finland have been arrested by police. 6 of the activists have already ben released and we are waiting for the release of the remaining activists. Amid the pressure of the global financial crisis, some ask how we can afford to tackle climate change. The better question is: Can we afford not to? W e are living through an extraordinary moment in the global economy. It’s a time when the bursting bubble of unlimited economic growth and unregulated financial flows have plunged nations across the globe into recession.